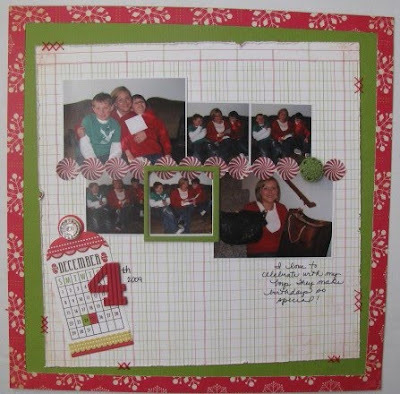 This month I am guest designer for Scrapdango Monthly Scrapbook Kit Club. Scrapdango offers two different kits each month - a "Sugar" kit (more feminine) and a "Spice" kit (more masculine). I received the Sugar kit for December and loved using the Girls Paperie "tinsel & Twig" Christmas line of papers. For my first layout, I created a 2-pager. I was thrilled to see that there were two sheets of the same patterned paper. That allowed me to use the green dot paper for my background. In addition to the Girls Paperie papers, there was also a die cut sheet from Little Yellow Bicycle. I chose to split the die cut between my two background pages. 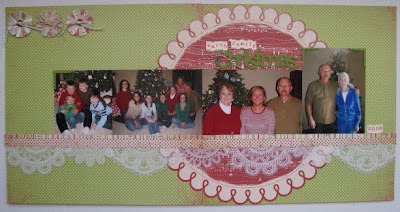 I pulled out family Christmas photos from 2008 for this layout and "smooshed" them all together. I had an area of blank space in the upper left corner, so I added the three Girls' Paperie flowers from the kit. I popped the buttons off the flowers so I could add some baker's twine through them. I finished that off with a bow. Then I added strips of patterned paper below them. To finish off my strips, I cut the Maya Road transparency doilies from the kit in half and lined them up for a fancy scalloped border. Instead of using the Bo Bunny alphas from the kit, I mixed up my title with mini October Afternoon alpha stickers and a Maya Road chipboard "Christmas" (from the December Spice kit) that I misted green. Since the words come on a key chain, there was a hole in the "C." I tied baker's twine through the hole and attached one of the keys from the kit to it. I also added some chipboard photo corners that I made by cutting down one of the chipboard window frames. For my December 4th layout, I REALLY, REALLY liked both sides of the snowflake/ledger paper. So, my solution was to cut a 1/2" frame from the outside of the paper. Then I cut another 1/2" off every edge to give me a 10" square. I adhered my outside 1/2" frame and my 10" square to green cardstock. I roughed up the inside square with an edge distresser. I had printed my photos as 4x6 collages so I'd have smaller photos to work with. I grouped them together on the ledger paper and added portion of a 12" Bo Bunny border sticker between my rows of photos. I added a cool Girls' Paperie button over one of the peppermint circles. I also took the outside portion of one of the Maya Road chipboard window pieces to make a frame around one of my smaller photos. (I misted the chipboard green.) For some finishing touches, I added my title using the "December" tag from We R Memory Keepers and a Jillibean Soup red corrugated number. Since the kit didn't include any ribbon, I decided to adhere one of the Bazill Basics Nostalgic Clear Vintage Buttons from the kit over the hole in the tag. I also added some random "x" stitches around the page. The ledger paper was perfect for journaling. The window chipboard shapes in the kit reminded me of how much I enjoy peeking inside windows (from my car!) during the holidays. So, I selected a couple shots of Blake's tree in his room from last Christmas. So I'd have plenty of room for my window to stand out, I separated my page into two sections. I misted the window shape and a valance with red mist and backed the window with a piece of patterned paper to make it stand out a bit. I added some paint to the top of the valance to resemble snow and added baker's twine to attach a key from the kit. I really liked the bracket shape on the Bo Bunny sticker sheet from the kit, but wanted to use a Girls' Paperie pattern. To get the bracket shape, I cut the bracket out of the sticker sheet, and pulled the negative shape off the sticker sheet. I adhered it to the patterned paper I wanted to use and cut around the bracket shape. My title is another mix of Jillibean Soup and October Afternoon. I trimmed my photos really narrow and topped one with a chipboard valance and button. The other has a chipboard photo corner that I made by cutting down a chipboard frame. In addition to the layouts, I made three cards with the kit. The window shapes made me think of "home" so I made a "from our house...(to yours)" card to give a neighbor. 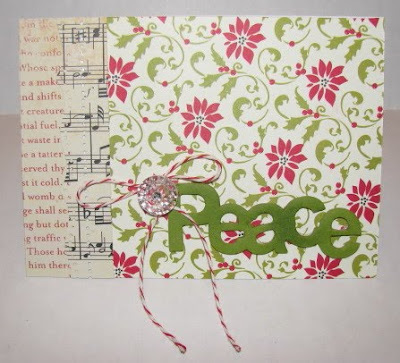 Adding a chipboard "Peace", I created another Christmas card using a mix of my favorite patterns from the kit. It's hard to tell in this photo, but the music note paper is punched with a border punch. 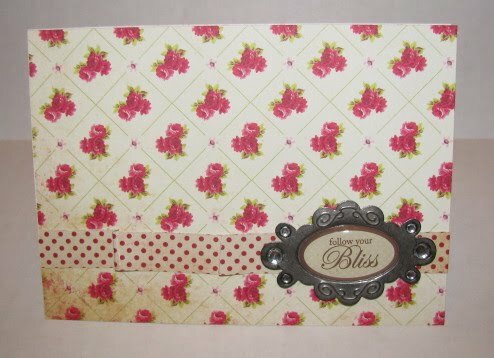 Finally, I created a non-holiday card by using the rose patterned backside of one of the patterned papers. I kept this one simple iwth just a strip of patterned paper and one of the Making Memories metal accents from the kit. I'd like to thank Heather at Scrapdango for the opportunity to be guest designer this month. It was fun! 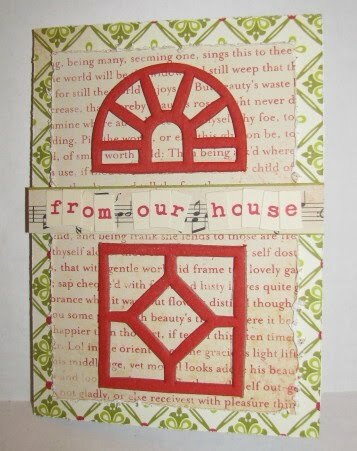 Fantastic...I love the first layout and the way you used the doilies...stunning.